The maintenance of your muscles plays a major role in healthy aging. By taking care of your muscles, you can impact your quality of life now and in the future. The proteins in our bodies continuously are being broken down and replaced. Protein is essential to life and needs to be consumed at each meal. 1. Our body needs protein for many reasons. Which of the following is/are functions of protein in the body? 2. About how much protein does a 3-ounce serving of meat, poultry or fish contain? 3. What are the primary fuels for muscles? Why is protein so important to your diet? Protein is a building block for bones, muscle, skin and blood. Adequate amounts of protein help heal wounds faster. Adequate protein helps fight infection. Protein provides the body with energy. Protein helps maintain muscle mass. Protein foods provide B vitamins, iron, zinc and magnesium. 5 signs you are not getting enough protein. You’re tired when you shouldn’t be. You feel weak, and simple tasks may become difficult. Your skin has become more fragile. Recovering from an injury, illness or wound takes longer than expected. You have swelling in your legs. Example: If you eat 2,000 calories a day, 10 to 20 percent of those calories should come from protein. What is a protein food? According to MyPlate, meat, poultry, seafood, beans and peas, eggs, processed soy products, nuts and seeds are considered part of the Protein Foods Group. 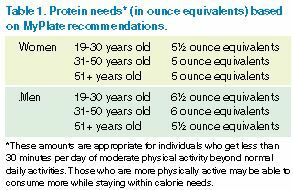 Protein needs are shown as “ounce equivalents” on MyPlate. Excess protein above calorie needs is likely to contribute to weight gain. Dollar for dollar, whole foods are a better buy than supplements because whole foods contain a larger variety of nutrients and other needed ingredients such as antioxidants. No conclusive research shows that concentrated protein sources (such as protein powders) are more beneficial than whole-food sources. Try Greek yogurt, which contains 11 to 14 grams of protein, depending on the brand. Try hummus (chickpea dip) or a bean dip with whole-wheat crackers. Enjoy a handful of mixed nuts, which will give you about 5 grams of protein along with healthy fats that are good for your heart. Eat a healthful diet, including adequate protein. Eat a variety of carbohydrates, including whole grains, fruits and vegetables. Stay physically active, using resistance training to maintain muscle strength. U.S. Department of Agriculture with a wide range of nutrition resources.